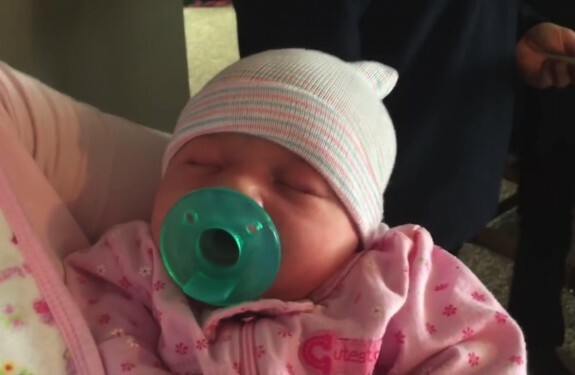 One Minnesota couple came so SO close to having a hospital birth, but their baby had other plans. Just before she was about to go to bed last Tuesday night, Kelly Schultz felt a couple big kicks and her water broke. Thinking they had time, the mom-to-be and her husband called the grandparents to come over to watch their older daughters and headed to the hospital. But, despite hitting all green lights on the way, Kelly’s contractions were coming at about two-minute intervals. “If there had been one red light, she would have been born in the van,” Kelly’s husband Cory told The Post Bulletin. As they were pulling up to the Mayo Clinic Hospital and were about to go in Kelly knew she wasn’t going to make it. “He (Cory) was saying ‘We’re so close’ and tried to get me in, but I had to lay down,” Kelly recalled. She could feel the baby crowning, and even Cory could even see the head through her sweatpants. It was at that moment that Deborah Vinje was heading to her car. On her way home after an 8-hour shift, the radiology technician spotted a woman lying on the sidewalk as she exited the hospital. “I didn’t know what was going on,” she said. “I thought she had fallen trying to get in the wheelchair,” she said. Once she realized that Kelly was in labour she attempted to call the hospital’s operator, but threw the phone when the mom-to-be started screaming. The baby’s head was already out so Deborah asked Kelly to push. Three pushes later the newborn baby girl was out. Just 50 minutes from when her water broke, the whole ordeal felt much longer to Deborah and the Schultzes. The medical team arrived in time to cut the umbilical cord before wrapping both Kelly and baby Kannon up in warm blankets. Everything had all happened so quickly, the Schultzes car was still running. Not knowing any more than her name, the couple immediately started a search to discover the woman who delivered their baby and thank her. “She kind of disappeared into the night,” said Kelly Schultz. Thankfully, the Mayo Clinic security team was able to identify her from camera footage, and on Monday, Deborah got to meet the family and hold little Kannon for the second time.